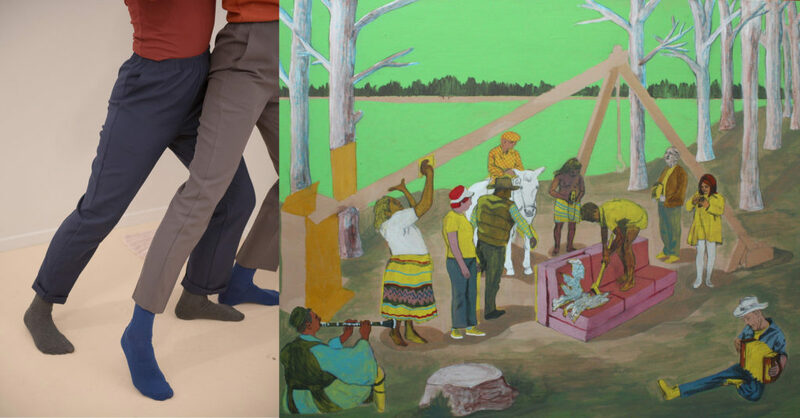 Shelby Wright & Katie Lyle (TO) will be presenting their Critical Distance performance in response to Matthew Gardiner’s painting exhibition, ‘You Can Never Go Home Again’. Gardiner’s paintings involve ambiguous interiors and exteriors that point towards the complex processes involved in contemporary experiences of place, time, and space. Given Gardiner’s themes, an embodied response seemed to be an exciting means of reflection. 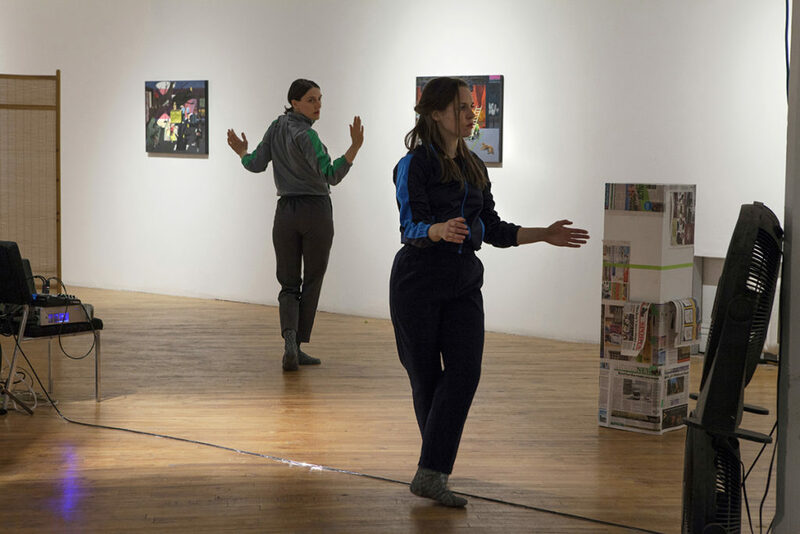 Katie Lyle and Shelby Wright make movement based work combining their artistic backgrounds in dance, film and visual art. 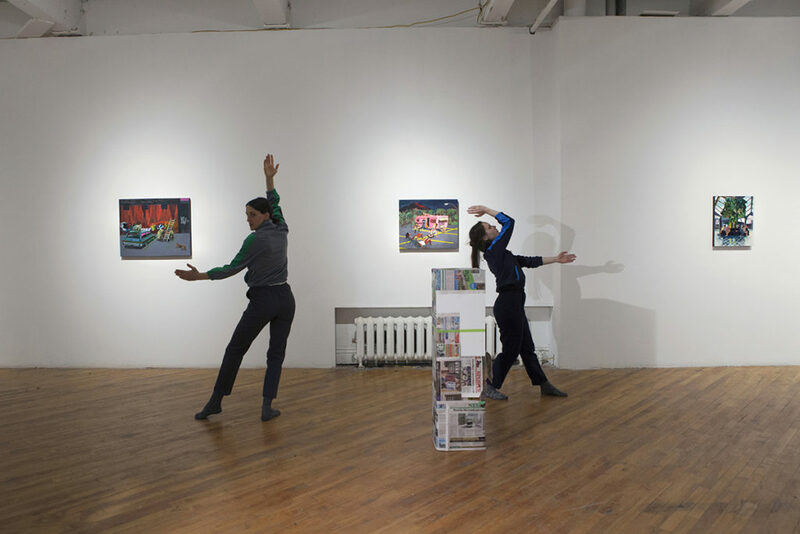 Together their collaborative practice focuses on the development of a shared language of movements and phrases. This system acts as a generative source for creation, problem solving and sharing of experience with each other and an audience. 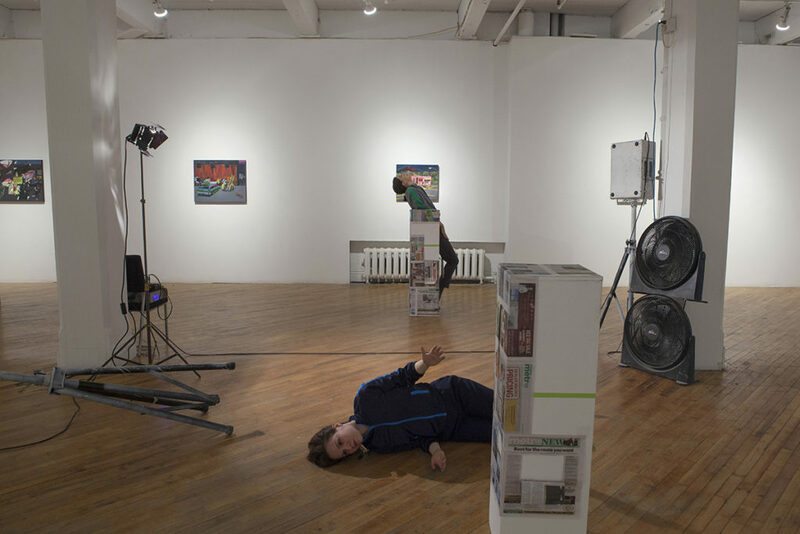 Katie Lyle works in painting, drawing and performance. Her work uses layering and the residual accumulation of paint to portray the unfixed nature of portraiture and narratives. 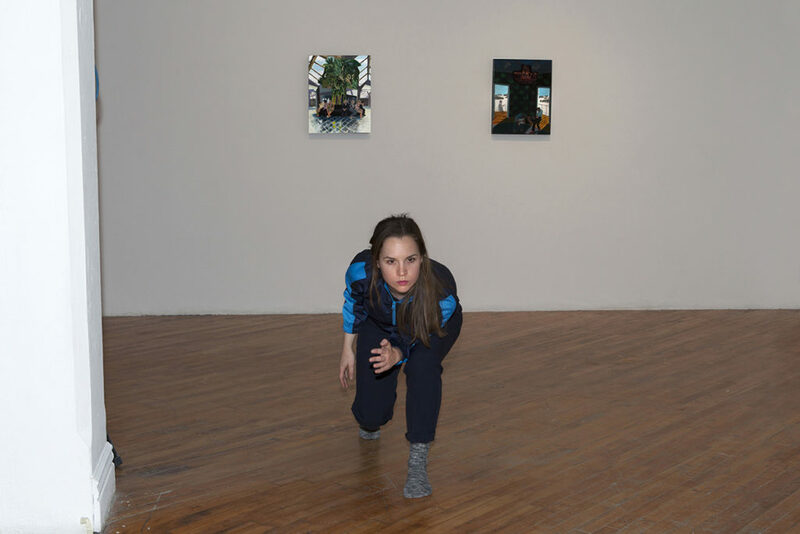 Selected projects include: The Loon, Toronto (March 2017); G Gallery with Bridget Moser, Toronto; Evans Contemporary, Peterborough; Forest City Gallery with Shelby Wright, London ON (all 2016); Erin Stump Projects, Toronto; Model Project Space, Vancouver; Garden Gallery with Shelby Wright, Toronto; and The Nanaimo Art Gallery (all 2015). Lyle received her MFA from the University of Victoria (2009) and her BFA from Concordia University (2005). She has taught Painting and Drawing at the University of Toronto and the University of Victoria. Shelby Wright is a dancer and choreographer based in Toronto. Wright’s work explores themes of memory, archive and transference through the body. She has received training from Canada’s National Ballet School, École de danse contemporaine de Montréal, the Limón Institute of New York, and holds a BA from the University of Toronto in Cinema Studies and History. She has presented her choreography in Montréal and Toronto, and has performed professionally in these two cities as well as New York. Wright is certified as Associate Teacher of the Vaganova syllabus from the Society of Russian Ballet. Born in Montreal, Matthew Gardiner obtained his Bachelor of Fine Art from the University of Manitoba in 2008. Since obtaining his Master’s of Fine Art degree from York University in 2012 Matthew has lived in Montreal QC, Winnipeg MB, Victoria BC and Toronto ON while continuing his studio practice. He is the recipient of provincial and federal grants and art awards. Matthew has recently attended a self-directed studio residency. His paintings have been showcased in publications and included in exhibitions across Canada and the United States. He currently lives and works in Toronto, Ontario.